Veteran small-time criminal Frank Lovejoy gets busted for hijacking a truck he stole. Because of his prison track record, both in doing time and in refusing to be a stool pigeon, he’s given the choice: life in prison or help the feds take down big-time crime boss Forrest Tucker. They also tell him to look up his sister Evelyn Eaton, who’s now a drug addict, and Tucker’s the supplier. Lovejoy has no choice but to accept. Through his old flame Peggy Castle, who was once employed by Tucker as a call-girl, he gets a position in Tucker’s organization where he can try and find something concrete on Tucker. There are tons of these noir(-ish) crime movies where someone infiltrates a crime ring in order to bust it from the inside out. This one’s above-average. 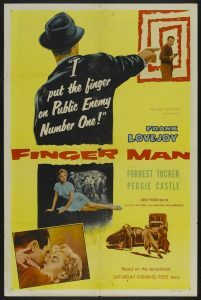 Within the confines of the Production Code it does all it can to make Tucker’s business as seedy and lowlife as possible, by showing the sister’s addiction as well as Tucker disposing of a prostitute he cannot use anymore. There’s nothing redeeming about this crime boss, but he’s also not some crazed lunatic. The acting is solid across the board. Both Lovejoy (‘The Hitch- hiker’) and Castle (’99 River Street’) are good, playing hardened- by-life characters but with human emotion under the exterior (in Lovejoy’s case pure rage, Castle wants to settle down but knows her past will always come back to haunt her). Tucker (in his sole noir?) plays it straight and understated, giving his character a mean edge, even when he doesn’t talk. Tucker’s sidekick is none other than Timothy Carey (‘The Killing’), who has some very nervous fingers in this movie. But as much as I like seeing Carey being Carey, his hyperactive acting felt kinda misplaced here, it’s too big a contrast. The movie looks pretty good, especially the nighttime scenes are well-done. Lovejoy does some nice voice-over narration with lines that could’ve been pulled straight from a 40s pulp novel. There are no surprises tho, altho there rarely are in these ‘expose’-type noirs. Director Harold Schuster did a similar noir a few years late, ‘Portland Expose’, but this one’s better. DoP William Sickner (‘Cry Vengeance’) does a solid job, and together they occasionally craft a beautifully-looking scene (the one where Castle walks into the night is tender and doomed at the same time).